A scene of neighborhood life, in this photograph taken on August 8, 1951, is captured at the corner of Niagara and Potomac streets. 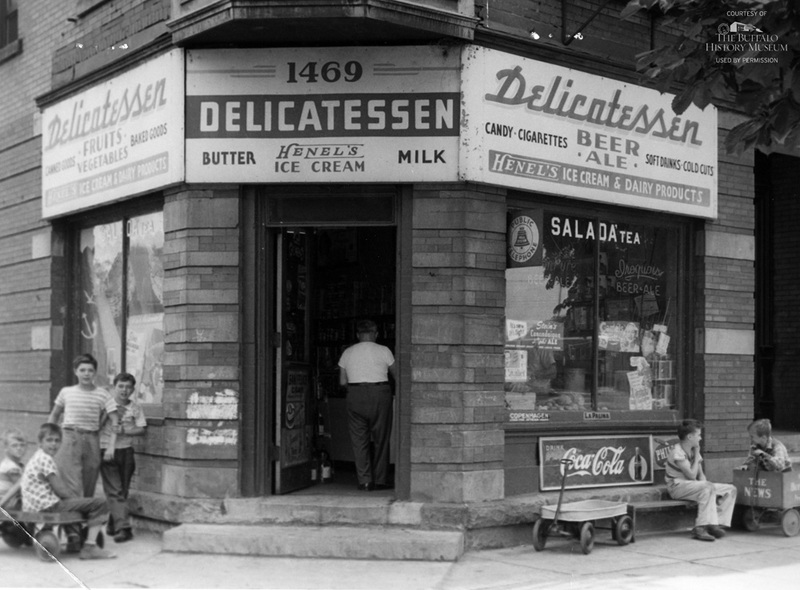 Here, Russo’s Delicatessen—one of 612 delicatessens in Buffalo in 1951—occupies the ground story of the Riverview Apartments, 1469 Niagara Street. Advertisements for locally made goods include Iroquois ale and beer, Stein’s Canandaigua light ale, Simon Pure ale and beer, and Henel’s ice cream (of Henel’s Dairy on Delaware Avenue in Kenmore). Boys gather on benches and Buffalo Evening News carts. The storefront has been vacant since at least 1982, and the upper three stories of apartments since a fire vacated the building in 2000. In 2015, the building was purchased for $130,000 by 623 West LLC, registered to Amherst homebuilder Kevin R. Myszka. Myszka began then ceased renovations, and resold the building in 2016 for $375,000 to Bezel LLC. Plans for the building, which remains vacant, are not known. Image courtesy of The Buffalo History Museum. Used by permission.